Book one of the Final Days Trilogy- Earth has been plagued by wars for centuries and advances in technology gives mankind the ability to explore nearby star systems. This technology sparks a new space race to colonize new worlds. After a century of discovering, exploring, and colonizing, no life forms are found-not even single cell life forms. Nations have to import life from Earth to terraform these worlds at great expense. As a result, the answer to the age old question, “Where did life on Earth originate?” becomes very important to the survival of the once powerful United States. If the United States knew the answer, it would have an advantage over other nations to not only survive but dominate. In 2372 the United States builds the state-of-the-art starship Stephen Hawking to discover the origin of life, and uses Special Forces Marines to “acquire” elite scientists from unfriendly worlds to ensure success. 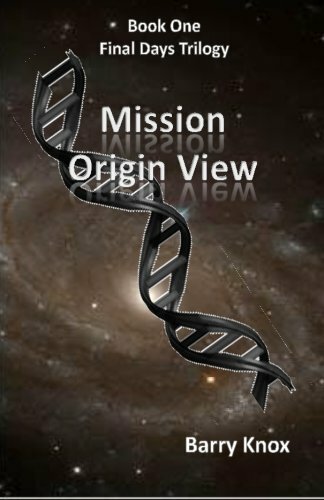 The starship then begins a journey to an observation point billions of light years from Earth to use advanced long-range sensors to look back in Earth’s history to discover the origin of life. What they discover is astounding and could very well lead to the final days of the human race. Barry Knox writes Christian military science fiction or what is sometimes referred to as Christian speculative fiction. His works carefully blend in feasible science fiction technologies and events with Biblical facts providing the reader with exciting possibilities and spiritual gratification. Barry was born in south Alabama, lived many places, and currently resides in Birmingham Alabama. Throughout his career, in the United States Air Force and private technology industries, he has worked in highly classified areas and extraordinary environments which used leading edge technologies to accomplish things that were once considered science fiction. This technological experience, his faith as a Christian, and a Bachelors and Masters Degree in Computer Science, gives Barry the unique ability to look into the future and speculate what type of world man may inhabit and how God will be perceived.